Josh Arrington, left, and Sharon De Boer, Executive Director of the Child Advocacy Center. Automobiles were on Josh Arrington’s mind when he attended a Friday night car show at Belk’s at the Avenue shopping center in Murfreesboro. But two persuasive women begged Arrington to adopt a quack-pack of ducks to raise funds for the 5th annual Duck Derby. The Derby raises funds to provide services for child abuse victims at the Child Advocacy Center of Cannon and Rutherford counties. Arrington, a 2003 graduate of Cannon County High School, forked over $25 for the ducks. Susan Lankheet, the Child Advocacy Center Cannon County Coordinator, was excited that someone with Cannon County ties won the Demos' gift certificate. 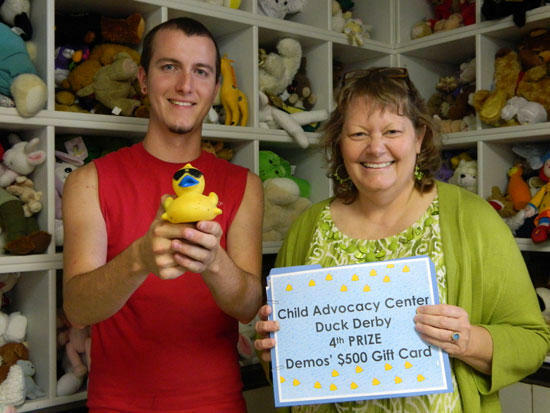 Lankheet said, "This year, we had the best duck adoption sales that the Child Advocacy Center has ever had in Cannon County. We really appreciate the support of our community for the child abuse victims that we serve." Since it was founded 12 years ago, the Center staff has helped more than 7,500 child abuse victims, child sexual abuse victims, and drug endangered children in Cannon and Rutherford counties. After the race, Arrington received a phone call notifying him his duck earned him a $500 gift certificate from Demos’ restaurant. Arrington works at OHL Inc. where he handles distribution for Starbucks restaurants. “My boss didn’t believe I won,” Arrington said. His favorite Demos’ menu item is a bacon-wrapped filet. He planned to spend part of the gift certificate the evening he received the prize out to dinner his girlfriend, Christine Harrison. “She’ll probably spend most of it,” Arrington said with a laugh.